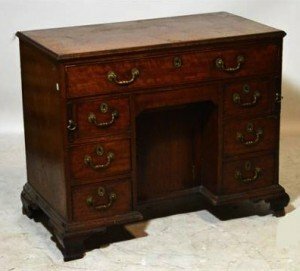 A George III mahogany kneehole desk, the moulded rectangular top above frieze drawer with divided interior and supported on twin loafers with “secret” central drawer above cupboard door flanked by two banks of three short drawers, to ogee bracket feet. 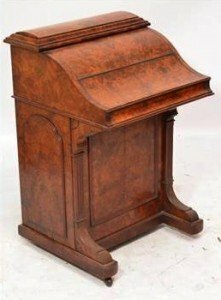 A Victorian figured walnut pop-up piano Davenport, the rising superstructure with fret carved panel and three drawers and stationery compartment, above a hinged lid enclosing a slide with gilt tooled leather set writing surface, pen tray and inkwell compartments, with side cupboard door revealing four drawers to a plinth base. 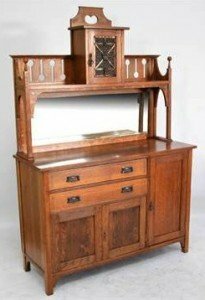 An oak Arts and Crafts mirror back sideboard, the raised upper section with frosted glass copperbound hinged door above bevelled mirror and base with two drawers and three cupboard doors raised on square section supports. 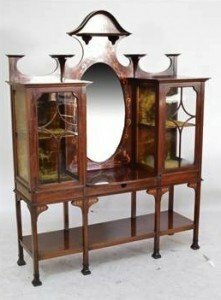 An Edwardian mahogany and inlaid Art Nouveau display cabinet by Thomas Edwards & Sons, Cabinet Makers, Newcastle, Staffs, the arched pediment above oval bevelled mirror flanked by twin glazed cupboard doors above a shelf with outswept supports, bearing enamelled plaque to one door. 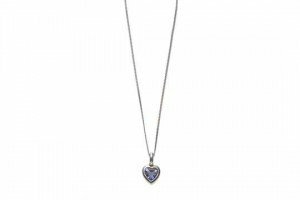 A 9 Carat White Gold Heart Shaped Pendant on Chain, the purple heart shaped stone in a white rubbed over setting with a small diamond surmounting it, on a plain polished bale, on a fine curb link chain. 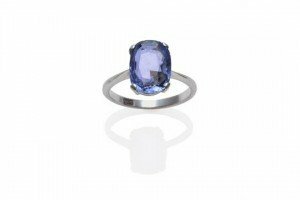 A Sapphire Solitaire Ring, the cushion cut sapphire in a white four claw setting on a tapered shoulder plain polished shank. 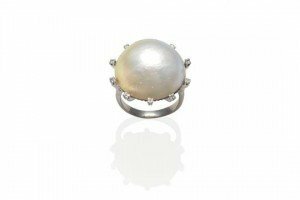 A Pearl Type Ring, a large domed mother-of-pearl within a spaced border of eight-cut diamonds, in white claw settings, to a fancy shouldered shank. A Diamond Triple Cluster Ring, three clusters of round brilliant cut diamonds in floral forms, within pavé set twist shoulders, on a white plain polished shank. 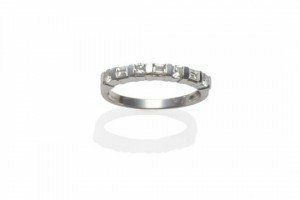 A Diamond Half Hoop Ring, round brilliant cut diamonds alternate with baguette cut diamonds, in a white bar setting. 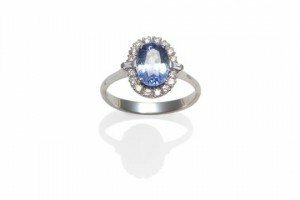 An 18 Carat White Gold Sapphire and Diamond Cluster Ring, an oval mixed cut sapphire within a border of round brilliant cut diamonds, and baguette cut diamonds to the shoulders, in claw settings to a tapered shoulder plain polished shank. 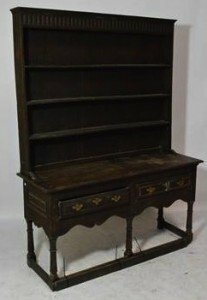 A 19th century and later oak dresser with associated plate rack above two drawers, shaped apron and six stretchered supports. 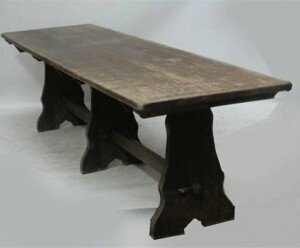 A long rustic oak plank top refectory table raised on three shaped supports united by a central stretcher, length 274cm, width 74cm. 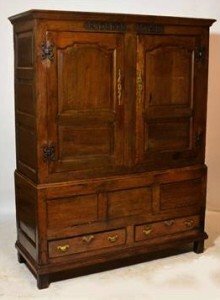 An 18th century and later adapted oak linen press with twin fielded panels to the upper doors above a base set with two drawers raised on stile supports, the base formerly a mule chest, both sections associated, width 150cm. 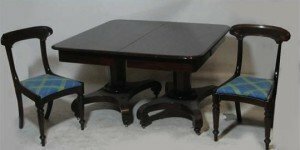 An early Victorian mahogany twin pedestal dining table, the rounded rectangular top with two additional leaves above octagonal turned end columns to quadripartite scrolling bases, length when fully extended approx 245cm, and a set of ten early Victorian mahogany bar back dining chairs with drop in concave seats and hexagonal turned front legs to peg feet. 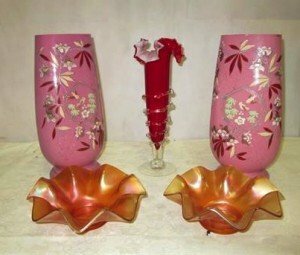 A pair of late 19th century pink glass vases painted with flowers; together with a Murano vase and two carnival glass bowls. 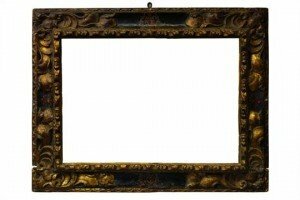 A Spanish Carved, Ebonized and Parcel Gilded Cassetta Frame, 17th century, with cavetto sight, egg-in-nest and beaded front edge, the reverse hollow with boldly scrolling leaf cartouche corners, armorial painted centres and demi fleur back edge. 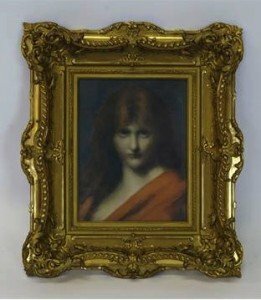 A French Gilt Composition Louis XV Rococo Revival Swept and Pierced Glazed Frame, late 19th/early 20th century, with gilded slip, leaf ogee sight, the cross-hatched hollow with leaf and flower head centres, cartouche foliate corners, raked gadrooned top rail, plain reverse hollow and shaped back edge with foliate centres and corners, containing a reproduction print after Jean-Jacques Henner. A George III mahogany freestanding corner cupboard, the upper section with barrel back, moulded cornice above two double panelled doors enclosing green painted interior and a base of two further panelled doors, both sections with stop fluted uprights to a plinth base. 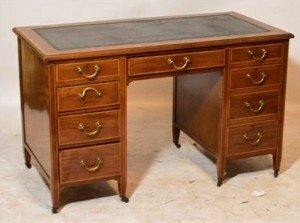 An Edwardian mahogany and satinwood inlaid kneehole desk, the leather inset rectangular moulded top above central frieze drawer flanked by two banks of four short graduated drawers to squat square section tapering legs and castors. 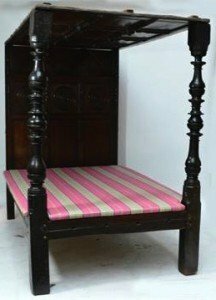 A 17th century and later oak four poster bed with panelled canopy, panelled back set with three ring turned sections and baluster ring turned front uprights.